My household does not have a dish washer. This might not seem like a big deal, until you realize how much I cook and bake on a daily basis. Most days I end up doing at least two large loads of hand washed dishes, and then there's the drying and putting away on top of it all. There are some nights that I have absolutely no desire to clean-up, but it still has to be done. Due to my dishwasher-free status, my favorite meals are ones that can be done with minimal clean-up. 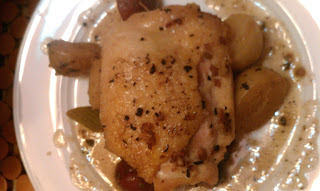 As I was glancing through a recent issue of Everyday Food magazine I noticed a recipe for One-Pot Chicken with Sausage and Potatoes, which looked perfect from my dishwasher-free household. This recipe has 10 ingredients, including salt and pepper. The total time is 50 minutes, with 30 active. I was easily able to find all the ingredients at my local store, however I did make one substitution. Instead of using chicken breasts I used thighs. My whole family prefers thighs and if I made breasts they most likely wouldn't be eaten. Additionally, when preparing the recipe I didn't notice that the skins should be removed, so I left them on. I followed the remainder of the recipe as written. I loved that this recipe only uses one pot, reducing the amount of dishes that I would have to hand wash. My two boys loved the sweet Italian sausage and picked it out from the potatoes. 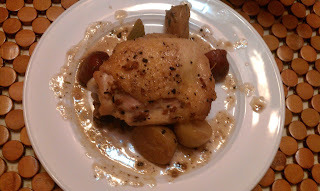 As always the chicken thighs were the biggest hit with my sons, chicken is one of their favorite foods. I found the potato-sausage mixture to be delicious and the highlight of the dish. This recipe is a quick, easy way to get dinner on the table, with minimal clean-up required. For the recipe go to Everyday Food One-Pot Chicken with Sausage and Potatoes. looks delicious. I like to make my chicken in a pan AND i leave the skin on! I'm officially hungry! I'm hungry now too! I also don't have a dishwasher and most days I am ok with that but my bigger baking/cooking days, I wish for one even if it's just to hide my dishes while I sit down! Glad this was a success! @Jacky Thanks :) I'm glad that someone else loves the skin-on like me! @Sheri I agree with you on the bigger baking/cooking days, they can be exhausting :) This recipe turned out great! Looks delicious! I love baked potatoes!! I'm now following you! Do you want to follow me back maybe? Looks delicious!! Thanks so much for stopping by my blog, now following you back!! Where in WV do you live, I'm super close! @BresBaubles I live in Huntington :) Where do you live? This looks absolutely irresistable! Thanks for stopping by My Own Four Corners; I am now following you back! Have a great weekend! This looks so good. I have a pound of defrosted chicken in the fridge right now awaiting to be made into a dinner and if I had some sausage I would totally make this right now! Looks delicious! Visiting from Photographer ...Naturally. Thank for following! Following back. This looks absolutely delicious! I am a big fan of food! !